Who were the Aryans? Who were the Dravidians? Who were the people who built the Indus Valley Civilization and why did they suddenly disappear? How are the Adivasis of India related to these other people. If you found yourself asking such questions at any point in time, this is a must-read book for you. The book is divided into four parts. The first part talks about how India and the Indians came to be. 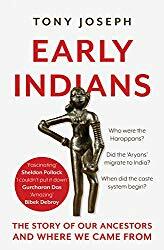 The second part talks about what is known about the “First Indians” – the very first settlers of this land – based on the current research. The third part talks about the people of the Indus Valley Civilization and what is known (and is still unknown) about these fascinating people. The fourth and the last part talks about the Aryans, especially in the light of the recent research in genetics and linguistics. All throughout the book, there are fascinating insights and nuggets of information. For example, the T*13910 allele provides lactase persistence, which allows a person to continue to properly digest milk and milk-based products beyond infancy. This genetic-mutation has been found in the population of India, with the lactase persistence being the strongest in the people living in the north-west of the country and the weakest in the people living in the south-east of the country. This suggests a migration and assimilation of a pastoral people into the country, moving in from the north-west. As another example, the Arghandab river in modern-day Afghanistan was known as “Harahuvati”, which is cognate with the name for the Sarasvati river, the mythical river in ancient India. “How Genetics Is Settling The Aryan Migration Debate” (The Hindu, June 2017). “Who Were The First Settlers Of India?” (The Hindu, September 2017). “Who Built The Indus Valley Civilization?” (The Hindu, December 2017). “How We, The Indians, Came To Be” (The Quint, April 2018). “How Ancient DNA May Rewrite Prehistory In India” (BBC, December 2018). Some of the startling insights into our origin as presented in this book are based on very recent research (with some papers having been published as late as 2018) and it should be noted that not all scientists in the respective fields agree with the conclusions (as is duly noted in this book, to be fair to the author). Even where the science is solid, the conclusions are an emotional hot-button issue for many people here, so expect a lot of misinformation around them in social media and elsewhere. The most important series of papers cited by the author are Reconstructing Indian Population History by David Reich, et al (Nature, 2009), Genetic Evidence For Recent Population Mixture In India by Priya Moorjani, et al (American Journal Of Human Genetics, 2013), and The Genomic Formation Of South And Central Asia by Vagheesh Narasimhan, et al (Biorxiv, 2018). These papers analyze the available ancient DNA to trace the ancestry of the current population of the Indian subcontinent. These papers use the coy terms “Ancestral North Indians” and “Ancestral South Indians” in order to escape unneeded controversy. It should be interesting to see how this book (and the scientific research it cites to back up its conclusions) holds up, say, ten years later. In the meantime, it does provide a lot of fodder for thought and is a definite must-read.